It's an odd thing: WebMatrix 2 is lauded for its support of HTML5, but the Web Pages framework doesn't include any helpers for the new HTML5 form input types such as email or color. It's fair to say that support among browsers for the new inputs is patchy at the moment, but with barely a week flying past without a new version of one or other browser being released, it won't take long for that to change. So in the meantime, if you prefer to use helpers, you have to write your own for rendering HTML5 forms. The class is declared as static. This is needed because the helpers are all extension methods on the HtmlHelper class. That means that theyr will appear as additional methods on the WebPage's HtmlHelper property. The enumeration (InutType) is declared to hold values that will be used to identify the type of input that the BuildInputTag method is responsible for constructing. I could pass in simple strings to represent the type of tag to be built, but enumerations are type-safe and prevent typo errors. The GetInputTypeString method is responsible for converting the enum value to its string representation. The main method is the BuildInputTag method. This is responsible for constructing and outputting the HTML for the input. It uses the TagBuilder class, and piece by piece, builds the tag with any attributes specified. It also sets the "value" by default to a matching value if one is found in the Request.Form collection. This will repopulate form fields in the event, say, of failed validation. The download that accompanies this article includes methods for all other HTML5 input types. The helpers are saved in a C# class file called Html5Extensions.cs in the App_Code folder. The balloons or callouts in the above image belong to the browser. They have not been invoked using any client-side code or libraries. The min, max and step attributes have been applied to the Number input. The Number input is represented as a spinner control in Chrome, Opera and Safari. It will restrict the range of values that can be selected, and will ensure that they are only available in steps of 5 in this particular example. HTML5 support among browsers is growing rapidly - especially in the mobile browser space. 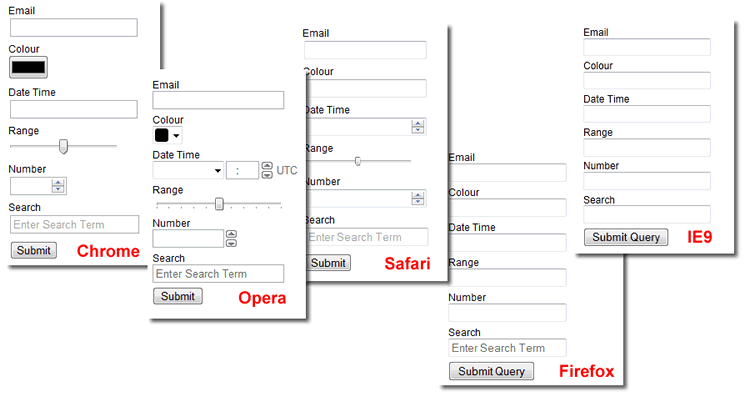 If you are working predominantly with HTML5, I hope these form helpers will be useful. If you are not there yet, the article should give you a good idea about how to create your own helpers to work with WebMatrix. A repo containing the complete code for this article is available at GitHub.